It’s not so bad, actually. As a first language, Java is okay – especially when it is taught right (inside joke there). Anyway, hot on the heels (somewhat cold, actually), of the Windows Shutdown Crapfest, comes the X Character Finder crapfest, courtesy of yours truly. First, a little background to this – at Uni I’m doing a subject called programming and problem solving. It involves Java. Our first assignment was to calculate some variable. Or something. Anyway – one of the things we had to do was find out if the user’s name had the ‘x’ character in it – in either upper or lower case. If you don’t really get what’s going on, I wouldn’t worry. Here’s the english explanation: Get a username. Count the letters in that username. Look at the first character – if it’s an X or an x, then we have an x in the username. If it’s not an X or an x, then we look at the next character in the username, and perform the same “Is it an X or and x check” again. We keep doing this until we either find an X, or we’ve run out of characters in the username. If you just want to know why this is the X Character Finder crapfest, well, it’s just because I’m re-inventing the wheel here, man – there’s a heaps easier way to find if a particular word/string has a particular character in it, and that’s via use of methods. This was the X Character Finder Crapfest, brought to you by Benny Ling. The offending function from the source code of Zune’s that caused the huge, epic Zune failure. For anyone who is wondering or just doesn’t want to figure it out, Dec. 31 qualified as being greater than day 365 (obviously, because it was day 366) but it got caught where the program says to look at (days > 365). 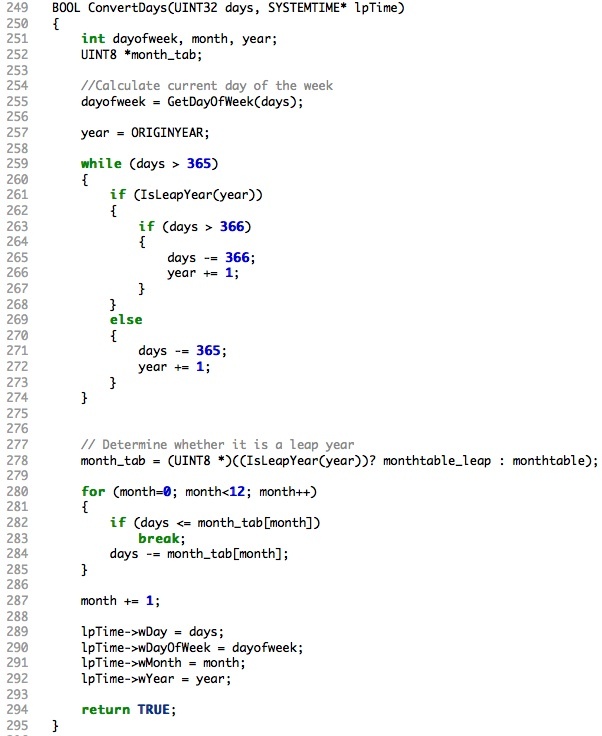 The problem is that there was no code for what to do if the day *equals* 366, only if days is *greater* than 366. So, there was no way to break out of the (days > 365) loop until today (day 367) when the program would reset days to 1, thereby breaking the loop. Whoops. It’s amazing what one bad “if” statement can do.